I buy my guns usually based on how it looks... And the Chaser, especially the Camo Chaser is what I want at the first sight on it! It's happy and lucky that Wes got these guns for sale and I got the full kit from Wes which being shipped and arrived in a very quick manner. It shoots pretty accurate out of the box. However I didn't shoot it much yet not only because I have another gun (a HW35E) arrived at the same time but also because I found some problem of the Chaser. Maybe it's new and still have some bugs like the beta version programs. I noticed following the manual to change it from pistol to rifle, I should be able to move the rear notch sight to the barrel band but obviously the pistol rear sight is not for installing on the barrel band ~ so it's very hard to use the stock open sight on the rifle mode with shoulder stock as you got very close eye relief distance between your eye and the rear sight. The trigger of the Chaser actually is very good. Not the best, but at least not comparable by the 2240~ but you need some time to adjust it to the 'sweet spot'. And the CO2 loading window to show you if a CO2 capsule was put inside the tube is very handy and helpful. Nice pics! That is a good thing to mention about the little barrel oring, as it's easy to lose. I like the Chaser pistol but wish it had fibre optic sights like I changed my 2240 to. My old eyes go blurry with no fibre optics when indoors. Chaser feels good in the hand and shoots well. Like most of my pistols I shoot it for an hour when I get it (then shoot the rest of my pistols that day) then they just sit in the pistol rack forever more. Love my scoped rifles. If you can not see where you hit through your scope, time for a new scope. like Cabales or maybe Brownells - if removable. Last edited by Daryl on Mon Dec 03, 2018 11:03 pm, edited 1 time in total. No reddot because that's what my two P17's are for. One for each of my in house ranges. Two shooting ranges don't share guns or targets. like Cabales or maybe Brownells. The front sight is pretty much part of the barrel. It is molded plastic that fits on super tight over the end of the barrel with a flat on the bottom that matches a flat on the bottom of the barrel. Yes was thinking a true pistol scope one day. Want to get my full power Airhawk shooting good first. No fun shooting tennis ball size groups at 30 feet. Driving me nuts. I've got a few different kinds if you're looking =). Ahem. This is a review post. Dealer's Corner is over here dealers-corner-f21.html. I agree with you whole heartedly, the chaser is fantastic value. 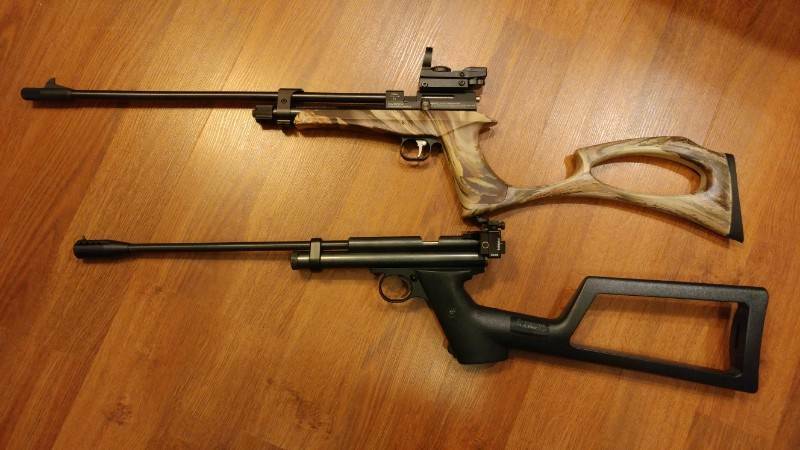 Especially if you compare it to the crosman 2240 which i imagine many of us have done. 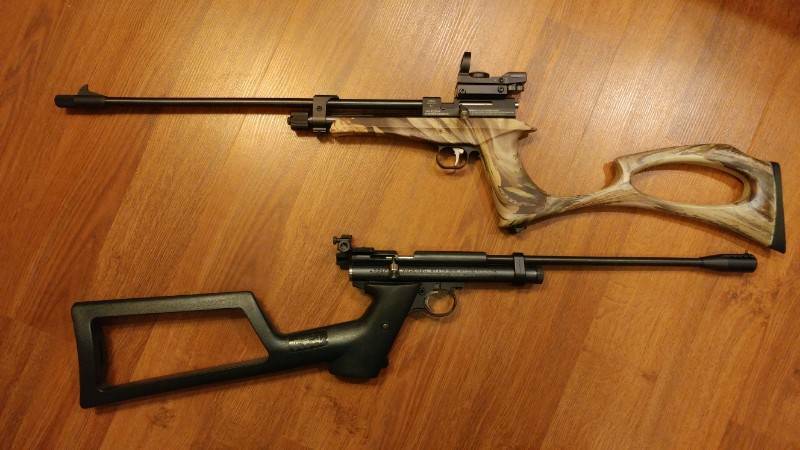 For the price of the repeater breech for a 2240 alone you could by both a chaser and a 2240... and yes, the 2240 has infinitely more options when it comes to customization but honestly i dont think most people are going crazy modding their 2240s especially once they realize how expensive it can be. 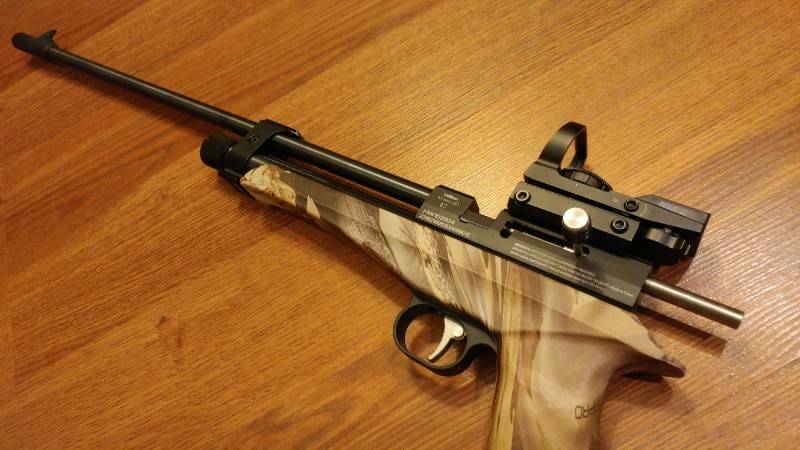 Now the interesting thing is that when i got my chaser months ago i was in love with it and couldnt put it down... i only ordered the pistol as i dont like the shape of the stock, however i think yours looks amazing in that camo print!... but now for some reason ive gravitated back to my 2240 and would rather shoot that over the chaser, even though my 2240 is basically stock. Im not sure why though because i definitely do like the chaser. Maybe it simply comes down to comfort, the chaser as a pistol is quite large and doesnt fit in my hand nearly as well as the 2240 does... i also dont like that the safty for the chaser is physically on the trigger, to me that doesnt seem like the most logical place for a safty but maybe thats just me? On a side note, i did just recently receive an Artemis CR600W and have been putting it through its paces(its awesome so far!). 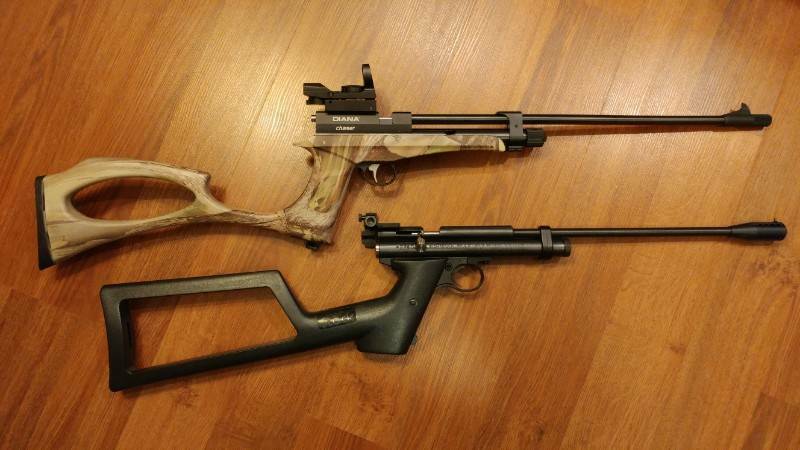 And i think that it could definitely be compared to the chaser in rifle form... which i cant really do because i only have the chaser in pistol form, but put it this way eveything i dont like about the chaser pistol is addressed in the CR600W rifle. Which is maybe a strong argument for people to purchase the full chaser kit instead of just the pistol. I'm waiting on my Chaser to arrive in the mail. I have a rookie question. Can you shoot it out of the box or do you have to clean the barrel first?